It's about now that people start putting up their decorations! This Sunday me and the boyfriend will be putting up our tree, and we have a little theme that we really love for our tree. I love a themed tree but I also love a really random classic tree! Ours is a mix of both, and that's what makes our tree special to us! 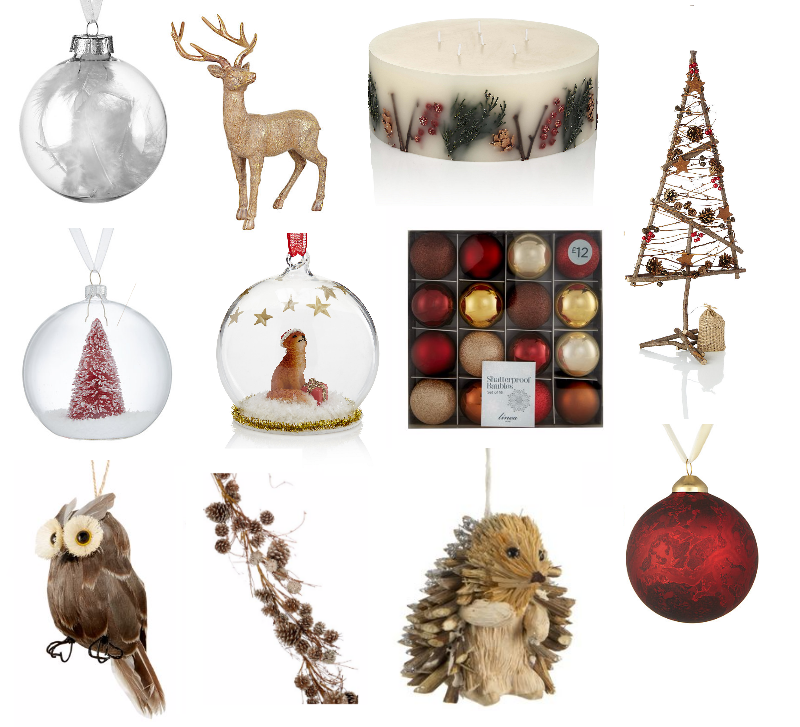 Here are a few of the baubles and Christmas decorations I'm looking at getting this year to update our decorations. As you can see, our theme is red, white and woodland! Simply, we love animals and classical Christmas colours! We didn't intend on this theme but it kinda just happened and we absolutely love it. I love the autumnal feel and wintery feel of these decorations and it looks amazing on a classic green tree! I'm really thinking about the fox, owl and tree baubles and special ones the most just because they're so different and would really sit well in our tree. One of our birds are a little mangled I think too so it might need replacing. On top of that just to add some more autumnal and bronzed colours to our tree I'd love to get the bauble set to add colour and texture to our tree! We're missing tinsel this year because we always think we have enough and then doesn't wrap around the tree so I'd love to get some red/gold tinsel in there as well as some new lights - because ours are too short. I'm so excited about tree decorating with John again this year. It's one of my favourite things to do around Christmas just because it makes it extra special that we have our own tree. I've already put up the family one with my mum last week... We were extra keen this year being in an upgraded house. It actually makes our tree look tiny now. But I love that there's two to decorate! Have you put up your trees yet? And share your Christmas decoration guides/wishlists with me - I'd love more inspiration!